← Day 83: Recycling Parade! I don’t want to be spreading corporate spiel around and promoting big business, but this story was just too good to pass up. Kraft is bringing two of my favorite things – cheese and waste reduction – together. They have announced that two of their New York plants will be turning cheese whey into energy, thereby producing less waste and saving money. Of course, they get to put a lovely green advertising spin on it all because the plants will now be using biogas instead of natural gas. But good for them. Why not save money and reduce waste at the same time? Not to pretend I scooped this story myself, here it is its entirety at Green Biz. 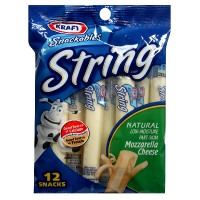 The irony of course is that one of the plants manufactures string cheese, a product which, although extremely fun and silly to eat (yes, i have tried them), is essentially a tiny stick of cheese individually packaged in plastic. I do wonder if that string cheese plant really needs to exist in the first place. I also wonder whether the second plant which manufactures philly cream cheese has any plans to do other things such as reduce the amount of virgin plastic it uses in the creamcheese containers. It seems to me that redesigning the products themselves might be better for the environment in the long run. If anything, I think this story highlights that although it’s great that large and very influential companies are jumping on board the green wave (expecially when it equals cost savings), there are still always more things that can be done. One step at a time I guess.